Lamborghini has officially entered the SUV market with the UK launch of the Urus. The 190mph 4x4 will reach showrooms in 2018 and be capable of covering a 0-62mph in just 3.6 seconds. 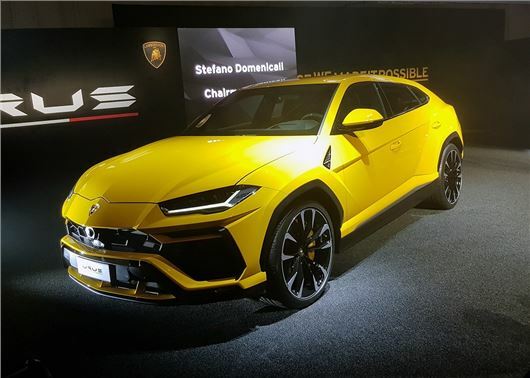 The Lamborghini Urus will be the fastest ever production SUV when it reaches the UK in the spring, with its twin-turbo 4.0-litre V8 petrol engine developing a supercar-rivalling 650PS and 850Nm of torque. Prices will also be unashamedly high, with the SUV starting in the region of £165,000. While the exterior design will split opinion, there’s no denying the performance credentials of the Urus. From a standing start, it’ll reach 124mph in a licence-shredding 12.8 seconds and the official top speed will sit at a heady 189mph. However, despite its 2.2 tonne kerb weight, the Lamborghini promises supercar handling thanks to all-wheel steering, active rear torque vectoring, and carbon ceramic brakes. Built on the same mechanical platform as the Audi Q7, the Urus will provide luxurious comfort for five adults with generous helpings of leather, natural wood and aluminium trims. Like the latest A8, the dashboard features two-tier 20-inch touchscreens that control all of the in-car settings. You'll also get a decent-sized 616-litre boot. Lamborghini tell us its SUV is a fully fledged 4x4 off-roader, but few owners will want to muddy their 5.2 metre long car by taking it off the beaten track. Those that do will be able to raise the air suspension for tackling everything from snow to sand. The car’s six driving modes also include dynamic and track set-ups, which will lower the ride height to improve high speed handling. Like the Porsche Cayenne and Bentley Bentayga, the Lamborghini Urus will be a niche SUV for those with extremely deep pockets. There are no details of CO2 emissions or fuel economy, but expect the latter to peak in the low 20s.